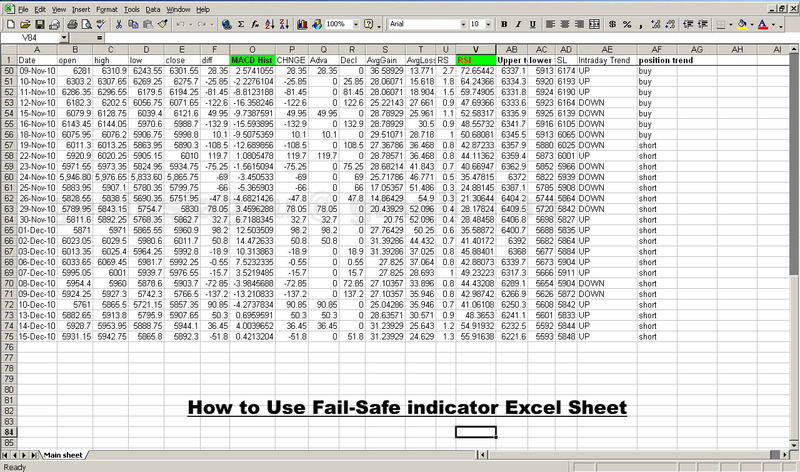 An Insight into Fail-Safe Indicator (FSI) is now XL ( Excel ) Trading system. 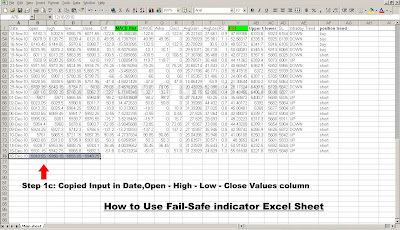 Fail Safe Indicator is now XL ( Excel ) Trading system is a Trading system which has designed in a excel sheet with pre-defined set of formulas that trigger entry and exits in a market on price value (Open-High-Low-Close) input. 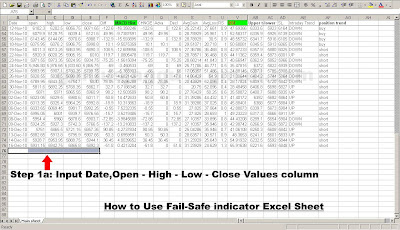 XL ( Excel ) Trading system requires data of just 7 trading days, which makes it potent weapon in trader’s arsenal. 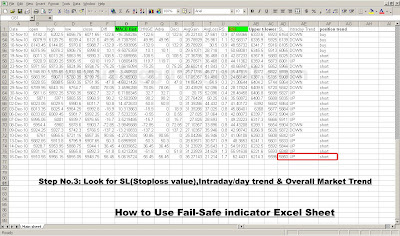 Fail Safe indicators is now XL ( Excel ) Trading system are made from stolid Moving Averages, which are more reliable than other lagging and leading indicators, since they follow market trend. 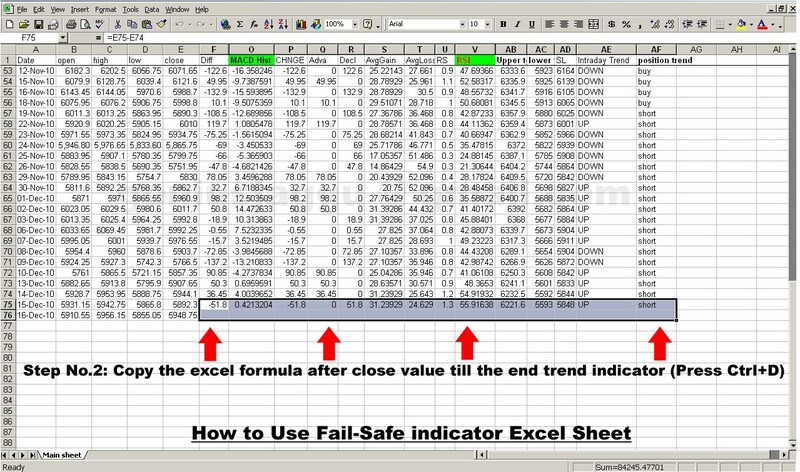 this 3 step simple & easy to use indicator is proven with tried and tested in various bull and bear markets with excellent results comparable to almost positional trade fail safe by jaggu. 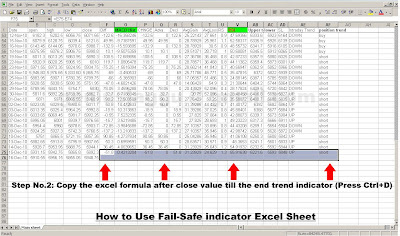 Name fail safe comes from fact, this indicator has to be updated daily and manually, so its free from any technical problem, there is less chance of failing/or giving wrong trend. 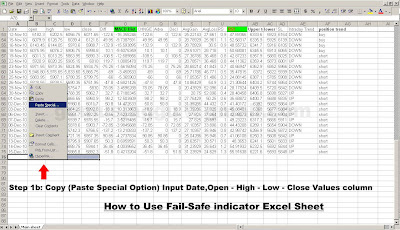 this indicator is used as Reliable End of Day (EOD) indicator, since it depends basically on Open-High-Low-Close values. StopLoss = this one gives the stoploss for your long or short position, u can also place same stoploss value to your stock portfolio with nifty as reference. its calculated on daily basis by excel formulas. Day trend = this indicator tells which is the best position for intraday trading, indicator tells u whether the market is in daily down trend or uptrend, this is meant for short term trading/day traders...since this value changes on daily basis. Market Type = tells us the current mkt trend whether its bear market(shown as Bear) or bull market (shown as Bull).. 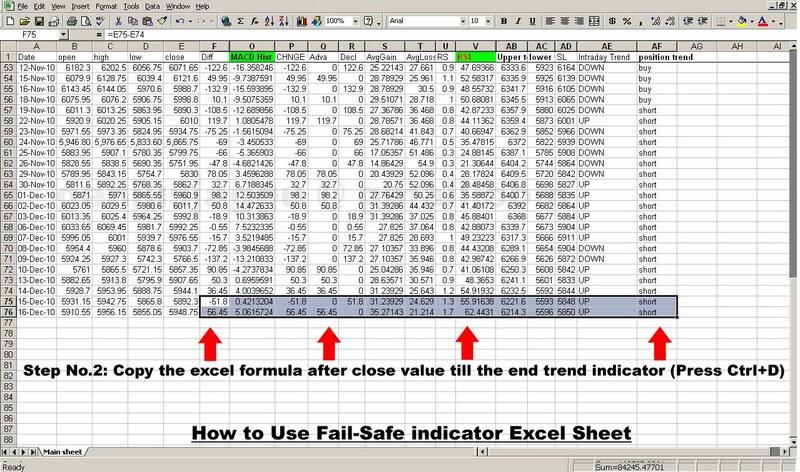 Warning indicator = this column tells when to buy the mkt (bottom of the down trend) and when to sell the index/mkt (Pinnacle of uptrend)..(this is useful to index only, not for stocks). A: (Nifty + Stocks / Equity+ Bank Nifty) trading system package. 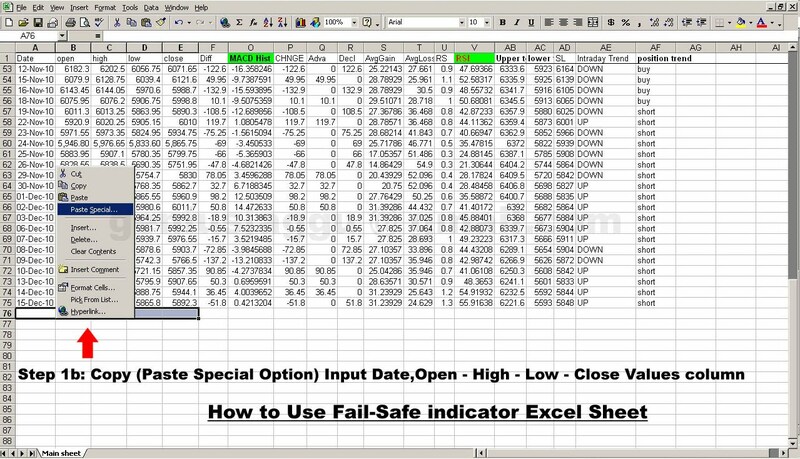 B: 1+1 Auto Updating Real time Nifty and BankNifty Intraday chart html files... just open it and run in internet explorer or firefox...u will get charts with signal for intraday updating every 5 seconds.... its real time software.. no installation needed.. just run the file. 1. 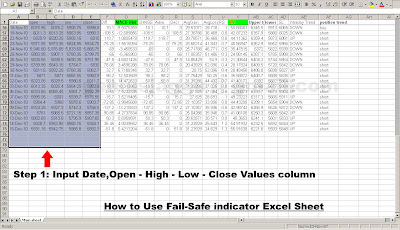 To calculate trin values and to copy paste nifty Open-High-Low-Closing Values to nifty XL sheet. 2. 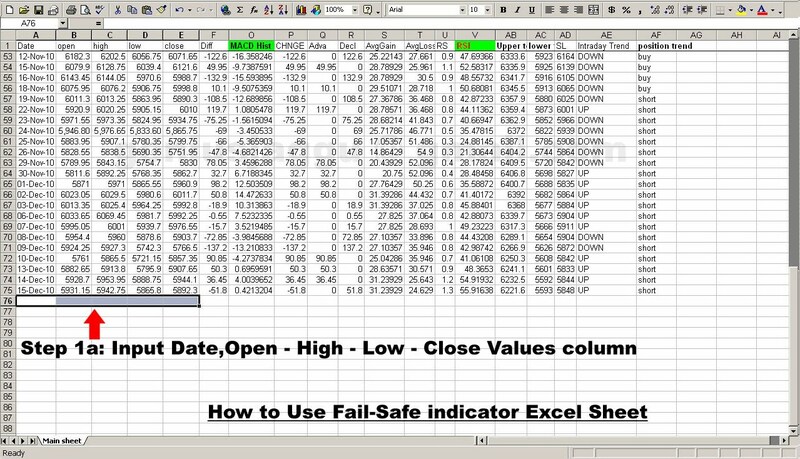 Nifty XL sheet ( this contains sheets, for index trading, Bank nifty and stocks)..
1: how to copy prices values from trin sheet to Nifty fsi sheet. 4: trade signals work examples ..this is important..here u will learn when the Intraday system gives u the signal.i have marked when u get signals for intraday in charts pic files. if any doubts, feel free to ask me...or mail me the doubts i will be happy to clarify it. pls note...i update only nifty sheet, since i trade only nifty futures, mastered it, no need to trade others. so other (like bank nifty and commodities) sheets are not updated frequently. but one can always trade any market/stock/commodity, as one wishes, as same rules/method apply to all things. Still any doubts, Training how to trade will given with the help of team-viewer software. 1.Improves your Trading skill, with perfect timing of trade signals XL trading system helps you in execute the trade,it makes trading easy. 2.Recover Your Losses, you have more control over trading patterns, enhanced loss recovery, shortening trade cycles. 3.Make new Profits, XL trading system helps you to make fresh profits exponentially without any limit. if you're not careful. so will be paying for monthly quotes/data/software fees to sit on your computer desktop,some of these can prove to be very costly for a typical day trader if you don't do your homework first, then you're paying too much. Another pitch Trading system software providers have, is being capacity of programming your own trading systems/scripts/easy language code. In normal life, the general public (lay man/small traders) will probably never learn this, or use it.So you should carefully consider whether or not you need all of this functionality, that's why i have given XL trading system with basic functionality with buy and sell actions. Another standard feature, one should definitely have is trading from the intraday charts capability. This is the only way i personally trade because I only use stoploss limits for my order entry/exits. Only a few systems have this feature but it's one I couldn't live without. I prefer to trade from a Full picture of Market trend with my indicators and Price positions showing directly on the charts. i have data of crude oil in Indian rupees..same can substituted with dollar or vice versa or any price values...here u can look at profits generated by fail-safe indicator with buy-sell points. In a bear market, 0.1--0.70 = overbought, 0.70--1.00++ = oversold. Meaning of oversold and overbought:. oversold means there are more sellers for a buyer,bullish if market rallied the previous day. overbought means there are more buyers than sellers,sometimes bearish,if rallied previous day. just pick only one trading signal reporting system, stocks or commodities or Forex at lowest price at Rs.10,000 or $200 ... No Nifty Index system available in this package. Super XL : Best Trading signal reporting system available in the market today with profits from trading Equity to Commodities and Forex. Master XL: gain confidence and make unlimited profits from Commodities in addition to Equity and indices. Standard XL: Value for money trade reporting system, make unlimited profits with standard excellent XL trading system by trading index and equity stocks. Super XL: Trade anything Index, equity, commodities and Forex, get unlimited profit without any fear of loss in any (bear market / bull market) market. Master XL: Best value for money for seasoned traders who trade Index, equity, commodities, this package gives profit without any fear of loss in Index,Stocks and Commodities. Standard XL: Best Value for money for beginners who want to make profit from Index and stocks. 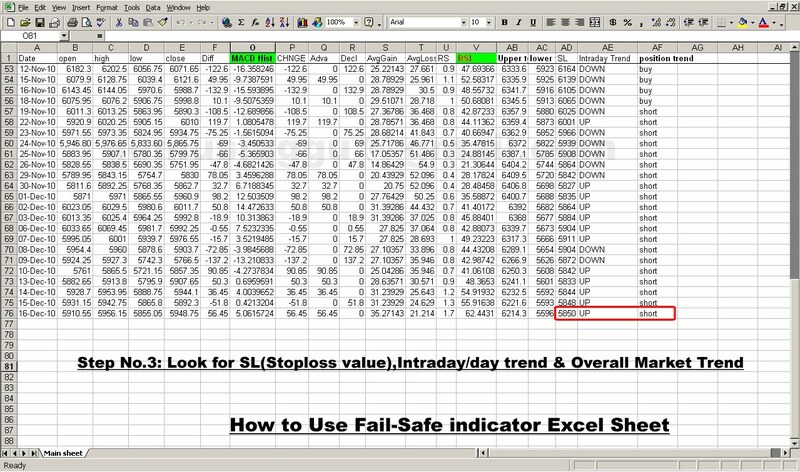 In Super XL Trade signal reporting software system (nifty + stocks + bank nifty + 4 commodities + Forex) package. 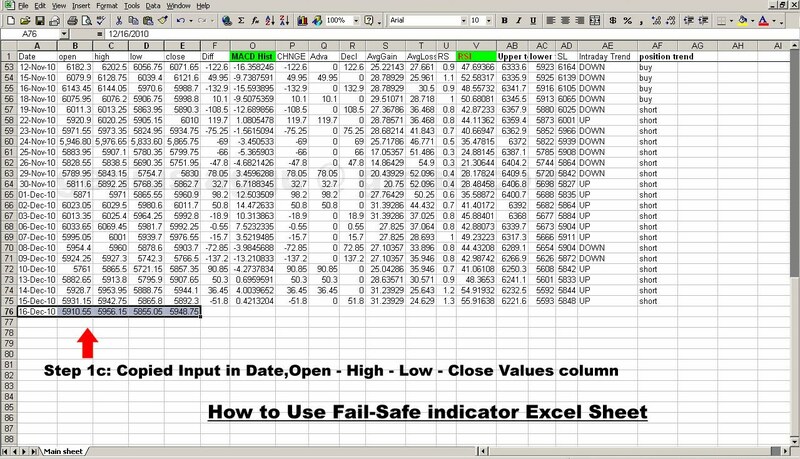 1+1+1 Auto Updating Real time Nifty, Bank Nifty and Sensex Intraday chart html files... just open it and run in internet explorer or Firefox...u will get charts with signal for intraday updating every 5 seconds.... its real time software.. no installation needed.. just run the file. 1. To calculate trin values and to copy paste nifty closing prices to nifty FSI sheet. 2. Nifty FSI sheet ( this contains sheets, for index trading, Bank nifty and stocks).. 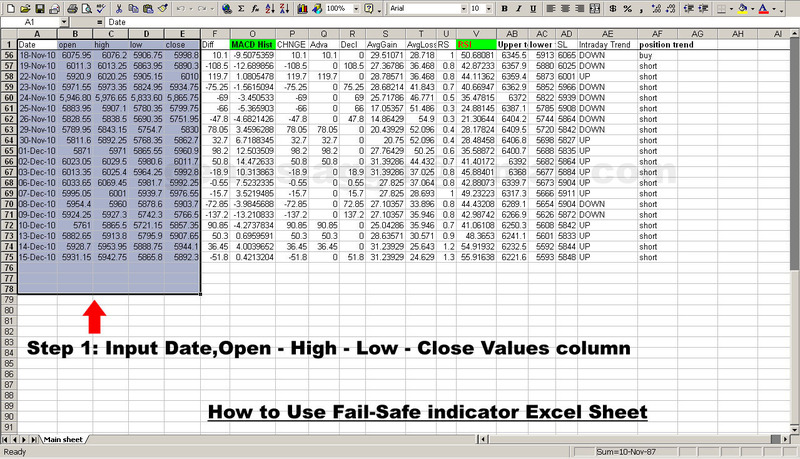 In Master XL Trade signal reporting software system (nifty + stocks + bank nifty + 4 commodites) package. In Standard XL Trade signal reporting software system (nifty + stocks + bank nifty) package. 1+1 Auto Updating Real time Nifty, Bank Nifty and Sensex Intraday chart html files... just run in internet explorer or firefox...u will get charts with signal for intraday updating every 5 seconds.... its real time software.. no installation needed.. just run the file. In Basic XL Trade signal reporting software system (choose from any one of systems, stocks or commodities or Forex systems) package. In Basic package, intraday charts for nifty, bank nifty and sensex are not provided. Please Note all package are Unlimited Use version, so NO Trials possible, and you will be given required training for trading and mastering the system.